I believe in the benefits of alternative medicine, much as I trust the medicinal value of various medicinal plants as lagundi, yerba buena, sambong and guava leaves, among others. Actually, I have some commercially prepared products at home that contain medicinal plants as their main ingredients. This may be my way of thinking because, looking back, during my childhood days, where I was still physically active and was always out in the sun to play with my friends, whenever I trip over or fall due to my clumsiness and eventually had a minor scratch especially on my knees and elbows, my mom would always get some guava leaves from the backyard then prepare it, either boil or pound them, to wash or apply directly to my wounds. Magically (as I believed it to be), my wounds would heal in no time with less incidence of infection. I knew then that guava leaves has an antiseptic property for wound disinfection and prevent the prevalence of infection, which may result to more serious problems later. I also learned that guava leaves are not just good for disinfection of wounds but also for numerous medical conditions. It can likewise be used for prevention of tooth decay and other gum-related problems by boiling it and using it as gargle instead of the commercially prepared mouthwash. In addition, for those having fungal infections, or having problems with bad smelling feet or even prickly heat, by simply washing the feet and other body parts concerned, with water soaked with guava leaves, you’ll be surprised on how this effectively works! 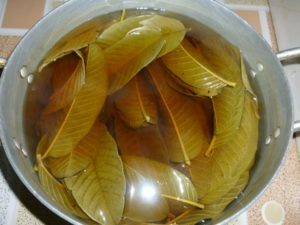 Today, as we have been already living in the village for quite some time now, I can hardly see guava tree around the village, therefore, my family and I are forced to use chemically prepared disinfectants and some medicinal products that contain herbal plants for specific use. Despite its effectiveness, I still prefer using the natural guava leaves. Eucalyptus – has cooling effect alleviating pain on wound or affected areas. Which all together soothe, nourish, and cleanse the skin, preventing it from infection. 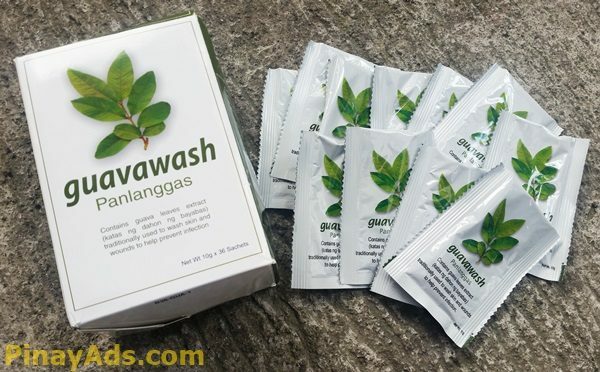 With this, I don’t need to pack guava leaves anymore, especially during travel times, but instead, carry with me Guavawash sachet and simply mix one sachet with 1 liter of warm water and use the solution just like how my mom used boiled guava leaves before or simply put, soak the affected area for around 10-15minutes!